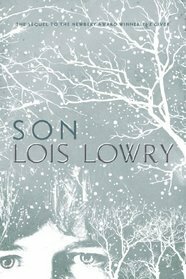 Son by Lois Lowry. Houghton Mifflin Books for Children, 2012. Currently Available. Face Value: Oh, I love this new set of covers for the quartet that’s being released with Son. Simple and evocative, these covers capture the tone of the series perfectly. I could see myself going out and purchasing new covers of the first three, just to have the matching set. Does it Break the Slate? Resoundingly, yes! Son, and the entire Giver quartet, are build around a series of Slatebreaking concepts. The way that knowledge changes you. The responsibility to act on that knowledge. One individual’s responsibility to him or herself, and to a society at large. What makes us the people we are? Lowry’s epic and empathetic conclusion to this series addresses all of these themes and brings us a new Slatebreaking heroine in Claire. Who would we give it to? Well it’s not going to be a tough sell. Kids and adults love The Giver, and will be lining up to read how the four-part story comes to a close. And while Son could stand on it’s own, I wouldn’t recommend it to anyone who hadn’t read the first three books – it’s a much richer experience with the whole breadth of the story coming together. But I would hand this series to any young person who is ready to start engaging with complicated themes related to individuality and society, and what one young person can be responsible for. It will transform their whole world. Review: I have such a clear memory of reading The Giver for the first time. I was in sixth grade, and I borrowed it from my English teacher. I knew and loved Lois Lowry’s work because of Number the Stars and the Anastasia Krupnik series. But until I read The Giver, I had never experienced quite the same feeling. This was a book that challenged me, that made me question things and that made me feel like I was capable of really complicated thoughts and ideas. My specific memory is of stopping at the grocery store with my mom after school and refusing to go in, instead sitting in the car and reading, watching Jonas’s story unfold. Nearly 20 years later, I re-read the books, culminating with Son and, as an adult, I experienced a lot of the same emotions. This is a series of books that takes its audience very seriously. It expects a lot of us. We aren’t going to get all of the answers, and our expectations are going to be challenged. We will empathize with characters who have difficult decisions to make, and who have the power to enact real change in their worlds – not because they are given that power, but because they decide to take it for themselves. For anyone – young person or adult – these are powerful things. We’re lucky to have writers like Lowry who are willing to take them on over the course of decades. A major theme of these books is the power one individual can have, even in the face of an oppressive system. In the previous books, we see Jonas, Kira and Matty shake up the world they live in – an individual against a dangerous society. This idea, that one young person can actually change something huge, based on their own skills and the desire to do the right thing is one of the best, most Slatebreaking things these books have to offer. Claire, the protagonist of Son (at least the first two thirds) is a different kind of hero. Her goals – to survive, to find her son, to be a family – might seem smaller at first. But Claire’s capacity for great things, without the “gifts” possessed by Jonas, Kira, Matty or Gabe – it once more underscores Lowry’s point, that we can decide for ourselves what we want to do with our lives. She is a Slatebreaker because she is unwilling to accept the role that is assigned to her early on, and unwilling to accept an understanding of her world that keeps her from loving her child. If you’ve read The Giver, you’ll recognize early in the book that Claire, assigned to the role of Birthmother at age 12, will give birth to Gabriel, the baby whose planned release ultimately determines Jonas’s departure from the community. The first third of the book follows the same timeline of The Giver, from Claire’s point of view. My heart broke over and over again, as Claire fought to identify the emotions that overtook her following Gabriel’s birth and her ultimate understanding that she loves her son and would do anything to keep him. The second third of the book is Claire’s journey to do just that, as she grows from a vulnerable girl into a strong young woman. The final third is Gabriel’s story. It brings a remarkable sense of closure to this extraordinary four part series, as all the characters and their journeys come together. Unlike the first sequels, Gathering Blue and The Messenger, which merely hinted at the characters and events of the first book, Son is a true sequel to The Giver, bringing all four stories to a kind of closure. But like her earlier books. there are still big questions left unanswered, and the readers are left to grapple with their own understandings. Alongside an individual’s capacity for great change, the idea of mentorship is a prominent one throughout the series. Each of our protagonists has an adult in his or her life who helps them, who teaches them, and who loves them. This theme is almost as important as the idea of personal strength. It demonstrates that, while each character is capable of incredible strength, they also need to be learn from and be cared for by something else. Jonas has the Giver, Kira has Annabella, Matty has the Seer and Claire has Alys. These teachers not only provide our characters with the skills they need to change their worlds, but with the critical thinking skills and worldview they need to understand what needs changing. The love between parents and children is obviously crucial to this story, as Claire and Gabriel spend the book searching for one another. But the love between these mentors and their chosen children is also vital. We can make our own families, and that love can be equally powerful. The theatre company I work for, Childsplay is producing The Giver onstage right now. 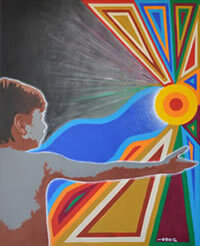 It opened last weekend, and performs weekends at the Tempe Center for the Arts through November 11. If you live in the Phoenix area – whether or not you have kids, you should come check it out. It’s a beautiful production, and it brings a whole different kind of life to Jonas’s story. If you’re reading Son and its predecessors right now, I can’t suggest enough that you experience this new way of living this story. For tickets and more information, visit www.childsplayaz.org. Reviewed from copy purchased at Changing Hands Bookstore. This entry was posted in Middle Grade, Reviews and tagged Childsplay, Dystopia, Lois Lowry, Speculative Fiction, The Giver, Theatre. Bookmark the permalink.